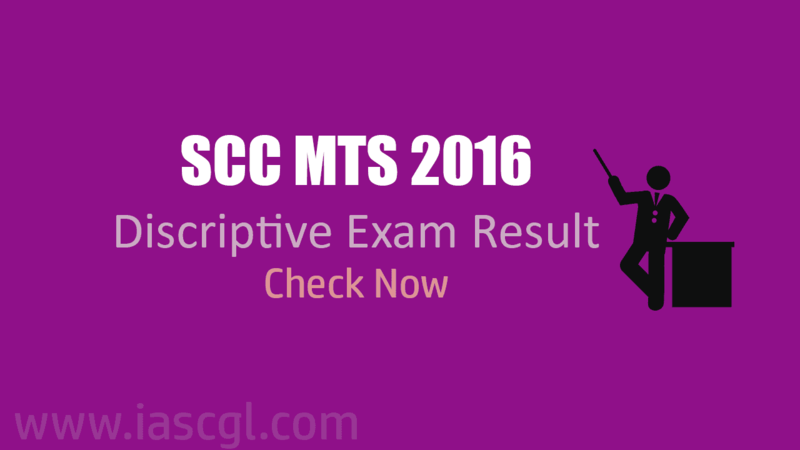 Staff Selection Commission(SSC) has declared result of SSC MTS 2016 descriptive exam. Staff Selection Commission has declared result of SSC MTS 2016 descriptive exam. Candidates, who appeared in the examination can check their result from the official website of SSC or a direct link given below. Candidates, who qualified descriptive exam are called for their document verification. The Commission has decided to call the candidates for Document Verification in a ratio of 1:2 for Vertical category vacancies (i.e. SC, ST, OBC & UR) and 1:3 for Horizontal category vacancies (i.e. EXS, OH, HH & VH) depending on the availability of candidates. Accordingly, based on the performance of candidates in Paper-I + preference of State/ UT exercised by them in the Application Form and keeping in view the tentative vacancies in each State/ UT, the Commission has fixed. Cut-off marks of candidates who will be called for document verification given in the pdf below.